Hilary John Deacon was born on 10 January 1936 in Cape Town. He attended school in Cape Town, studied Archaeology at the University of Cape Town (PhD 1974) and was a British Council Scholar at London University. Hilary Deacon started his career as a field geologist in East Africa and was later appointed Archaeologist and Deputy Director of the Albany Museum in Grahamstown, from 1963-1971. From 1971 he was head of the Archaeology Department at Stellenbosch University and a Visiting Fellow at the Australian National University, Canberra (1984), a Visiting Professor at the University of Chicago (1978), and a Visiting lecturer at the University of California, Berkeley, in 1986. He served on the Council and was a Past-President of the South African Archaeological Society, the Southern African Association of Archaeologists, the SA Society for Quaternary Research, and a member of the Board of Iziko Museums in Cape Town. 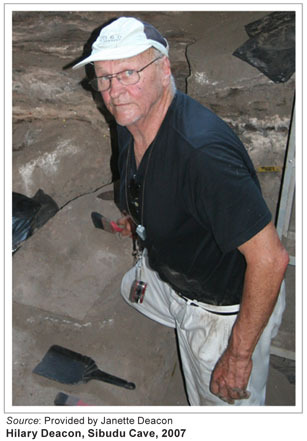 His research focused on the emergence of modern humans and African archaeology. Since 1984 he was principal researcher at the Klasies River Caves, one of the oldest known sites of anatomically modern humans who lived there circa 125,000 years ago. H J Deacon was married to the archaeologist Janette Deacon and they had three children: - Andrew, Harriet, and Melissa. Hilary Deacon died on 25 May 2010 in Stellenbosch. Some 100 publications in journals, books, monographs and conference proceedings.